2013 January «Come Play In The Kitchen! Come Play In The Kitchen! Well, I mentioned recently that I was interested in the cookbook challenge posted at http://growandresist.com/2012/12/21/cook-the-books-a-cookbook-challenge/. I had borrowed the January and February selections from my local library, devoured them page by glorious page recently when I was ill and stuck in bed, and then finally got into the kitchen today after finishing up chores, homeschooling and the like. I am so happy I did, with sweet results! I think Dorie Greenspan is my new hero…Her recipes sound so amazing, fresh and inspired. I cannot wait to purchase my own copy of her book Around My French Table so I don’t have to worry about ruining the library’s copy while I’m playing (messily at times) in my kitchen. Her stories are interesting and entertaining, as well as educational. But I will now forever love her for the inclusion of the top-secret chocolate mousse recipe. 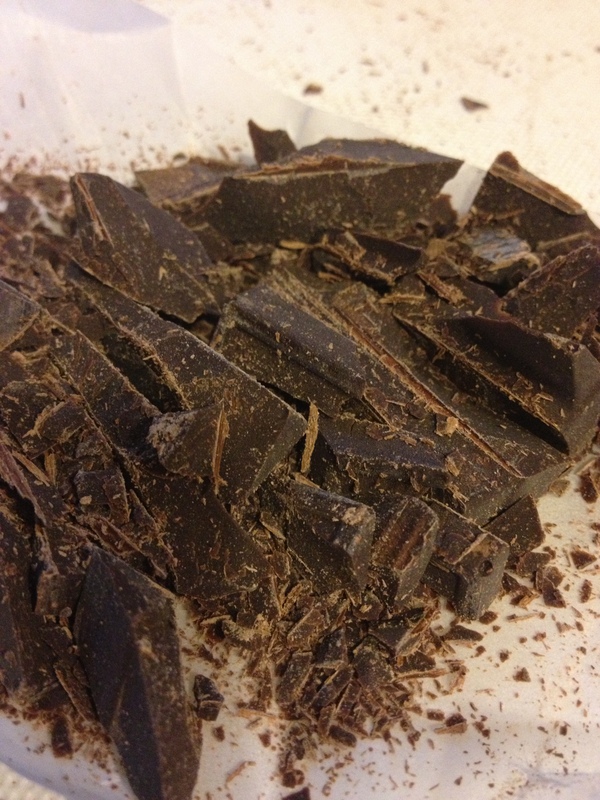 It is probably the best I’ve ever tasted — not to mention the absolute easiest! And hey, with such a large family and crazy life…Well, I’m all for easy! You will have to buy this book and try this recipe! This is definitely a keeper!!! My official recipe testers loved it and some were disappointed there were no seconds. 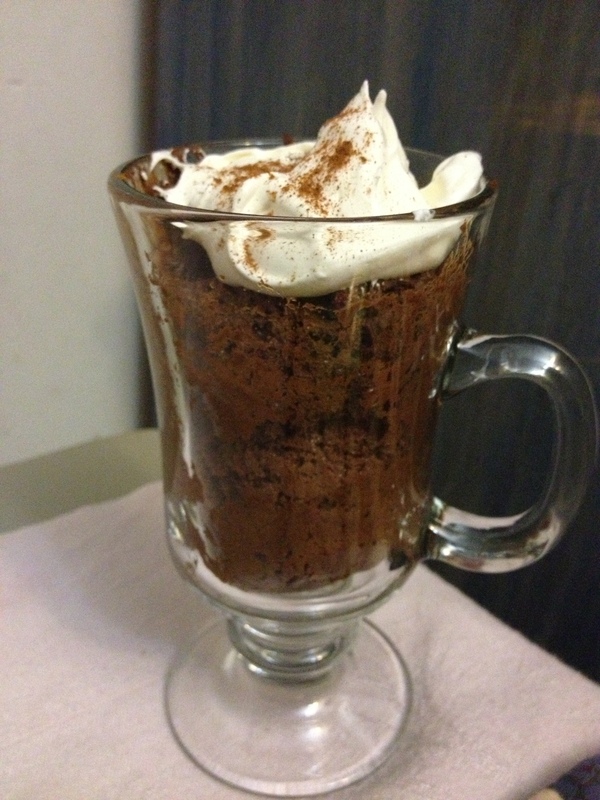 I served it with whipped cream and a dash of cinnamon, though a dash of cocoa would have worked nicely too. It was very light but yet dense with chocolate, if that even makes sense. My palate was in heaven. I have liked to read (and be read to) since early on. We’re talking All. The. Time. Just ask my mother. She was so sick of Green Eggs and Ham by Dr. Seuss that by the time my sister was born, my mother didn’t read quite as much to Noel because I wore out her vocal chords. And yes, my sister Noel was born around Christmas — she was my gift at age 2…under the tree in a Santa suit and everything…you can feel free to say “awwww…”. But I digress — My mom came to loathe and despise that particular book. I mean I can not stress enough how much she hated it. When my youngest son would ask her to read it (because of course he had his own copy! ), she would first clench her jaws — but sweetly try to get through it for his sake — which makes her a wonderful Nana, knowing how she hated it! So the other day I was kind of bored with my usual lunch choices…I guess that is a creative license to play in the kitchen for sure, right?! I was not in the mood for ramen noodles again, we had exhausted the surplus of leftovers I usually heated up and the kids opted for canned beefaroni (it was on sale and yes, sometimes I cheat…at least for lunches! ), which I was not in the mood for. At all. Well in my quest to (sometimes!) eat a little bit healthier, I had started to purchase more new-to-me whole grains, different dried fruits, new and untried (by us anyway) veggies, nuts, seeds…So there was plenty to experiment with. Yeah, I’m thinking “play in the kitchen”! And to top it off — I actually had a spare few moments!!! Kamut is an interesting grain. I find I appreciate it’s chewy texture and it is a great stand-in for rice, especially with the recent arsenic scare. Not many people have heard of kamut yet. Here is a site that offers some good information on various ways to prepare kamut: http://chefinyou.com/2009/08/how-to-cook-kamut/ I am really grateful to have found a local store that sells not just the grain, but also kamut flakes (which will likely be featured in a coming breakfast post!). Sometimes I don’t always plan too well, but some happy accidents happen in the kitchen, don’t they? I had hoped to pair the kamut with some frozen peas, but I’d used them up in a pasta alfredo-like dish earlier in the week and I was not about to venture out into the cold to run to the store — so I dug around in the freezer and found some frozen corn, which I much prefer over canned. 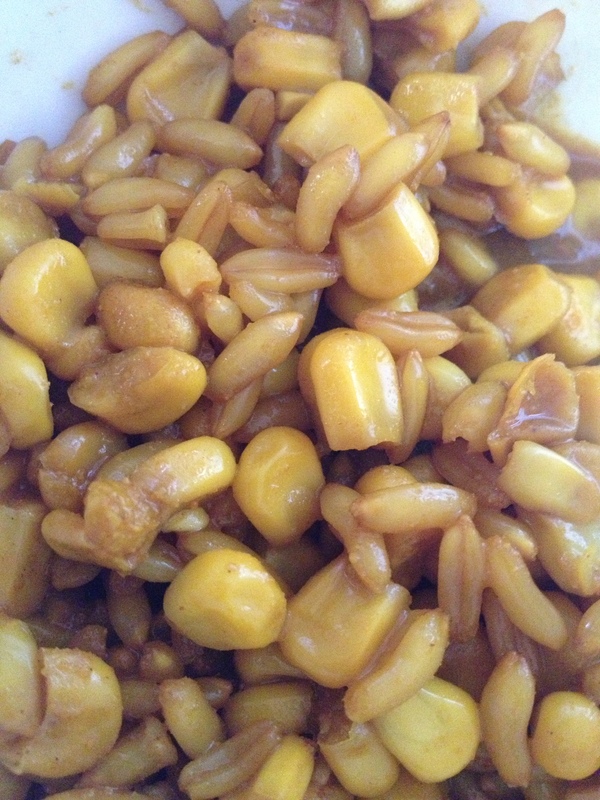 I found the natural sweetness of the corn complimented the entire dish, so I was not disappointed. * Boil 1 cup water. Add 1/3 cup kamut and then simmer, covered, til close to tender (about 35 minutes). * Add 1/3 cup frozen corn, 1 tsp turmeric and 1-2 tsp curry powder and let steam on low heat til most of the liquid is absorbed. * Season with salt to taste. In the original dish, I ate it as recorded in the above recipe — but for leftovers the next day it occurred to me to add some craisins (we were out of raisins) and some cashews. It gave the dish more depth of flavor, and I will be adding it to my “try on the family next time” list! I had been under the weather for more than a few days with a headcold. Then I set out to clean the attic and was beseiged by dust bunnies attacking from all directions…All in all, I was not too pretty a sight over the last several days. I really wanted to get into the kitchen and cook up something a little fabulous after perusing many recipes and discussing a few options with family and friends (I did try a Carrot, Ginger and Pear Soup which may show up on a post in the near future) — but since I wasn’t really feeling too creative I instead opted for quick, easy and comforting. I like to think that it was the influence of my parents doing foster care when I was younger that sparked a desire in me to be more compassionate and understanding about altered families and the children who are ultimately the ones that suffer. Les and I did foster care early on in our marriage, and I am so thankful that we had the opportunity to do it. Of course later we ended up adopting five children and though some of it was for the selfish reason that I wanted children and was told I would never have any, there is still a sense of having hopefully touched a child’s life for the better. I love all of my children and am happy to stay at home and watch them growing up. We still have the normal issues, and even some added adoption things, but we are very blessed just the same! * Saute 1 onion, sliced thin, in 1 Tbsp extra virgin olive oil and 1 Tbsp butter. Add 1 medium head of cabbage, thinly sliced, and saute til wilted. * Cook 16 oz. egg noodles per package directions. Drain. * Toss noodles and cabbage together and season to taste with salt and pepper. Serve warm. Like I said, pretty simple. The picture to the left doesn’t show the finished dish — can you believe I forgot?! I guess I’m still learning, so please continue to bear with me! 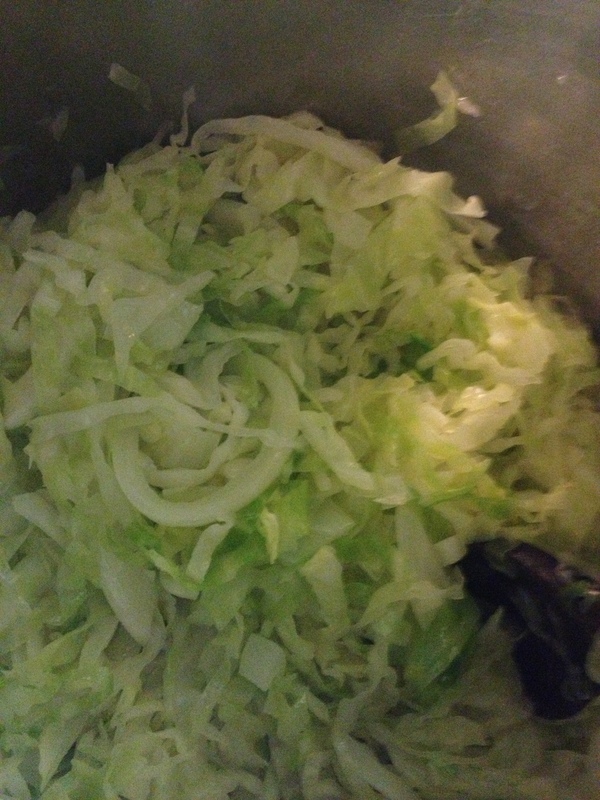 Now, of course I like to play in the kitchen, so I can’t say this is always the same dish…For example, I like to carmalize the onions and cabbage slightly; but I have also served it just after the cabbage was slightly wilted such as in the picture. To make this dish stretch, I often buy a larger head of cabbage and maybe add an extra onion. I also wanted to note that earlier in life I could not stomach onions in any way. Now I can eat them cooked, so in they go! By the way — this is an excellent way to make use of seasonal produce. Cabbage is pretty inexpensive around my way at the moment, and I am blessed to be able to still get some fresh cabbage at reasonable prices rather than have to rely on grocery store offerings. My husband, Les, has been hunting for the majority of his life. That doesn’t mean he always gets anything. In fact, there were quite a few “dry spells” over the last several years. My father-in-law lives in the home he grew up in, located in a somewhat remote (ie, not built up yet) area in south-central Pennsylvania. The little house sits at the base of a ridge, which is where my father-in-law, my husband and several of my children learned to hunt. Behind the house is a little patch of woods, with a field breaking the space up a bit before another stretch of woods dots the ridge. Somewhere amidst all the trees is a tree stand that Les built back when he was a teen, and which my oldest son patches up from time to time so it can still be used. I’m not really sure what the statistics are for the number of deer in Pennsylvania, but I do know that the number of hunters who descend upon our state every fall has got to be pushing a million, as license sales for 2011 totaled around 933,208 (from: http://www.outdoornews.com/August-2012/Pennsylvania-lags-in-sales-of-hunting-licenses/). I know a lot of people have issues with “killing Bambi”, but hunters in this state are more active in conservation efforts than in many other areas, and hunting really does control the deer population. I grew up in the suburbs of New Jersey, so I’m not too experienced with hunting overall…I took the hunter’s safety course with my now 14 year-old daughter. I’m honestly more of an “indoor gal” — as evidenced by most of my favorite past-times: writing, reading, sitting at the bookstore, cooking, baking…! Anyway, no one in our immediate family had gotten a deer in the last several years, but this year we were blessed to have Les get two — in one day! He shot a doe at first light, then got a nice buck later in the day. What this means is that we will have meat for our freezer, and it’s a more healthful and compassionate option than, say, buying bulk meat in the grocer that came from questionable means! I have seen many documentaries on slaughterhouses and I am convinced that hunting is really the less evil way to get meat. Les and the kids out-voted me to have a good portion of the deer turned into deer bologna, which I am not really a fan of…I had hoped to try my hand at making deer jerky. Maybe, but doesn’t seem terribly promising this year. Anyway, I am thankful that the family now has various cuts of meat for some hearty winter meals like stews, roasts and the like, as well as some ground venison for miscellaneous dishes. Not a gal who really loves wild game, I have to say that my mother-in-law coud cook a really tender, really amazing venison steak. Unfortunately she is no longer with us, having lost a battle with lymphoma in June 2009 the day after her 60th birthday. Les will often reminisce about some of the things she could do with food, especially with the cuts of meat that hunting provided for their family. I was kind of honored when he said that the meal I made last night replicated one of her meals…it was one of the highest compliments I have ever gotten. So without further adieu, here’s my recipe for a venison gravy. I served it over boiled pierogies last night for a quick, filling meal, but you could easily serve it over pasta or rice, or just over top of toast in an open-faced sandwich kind of way. 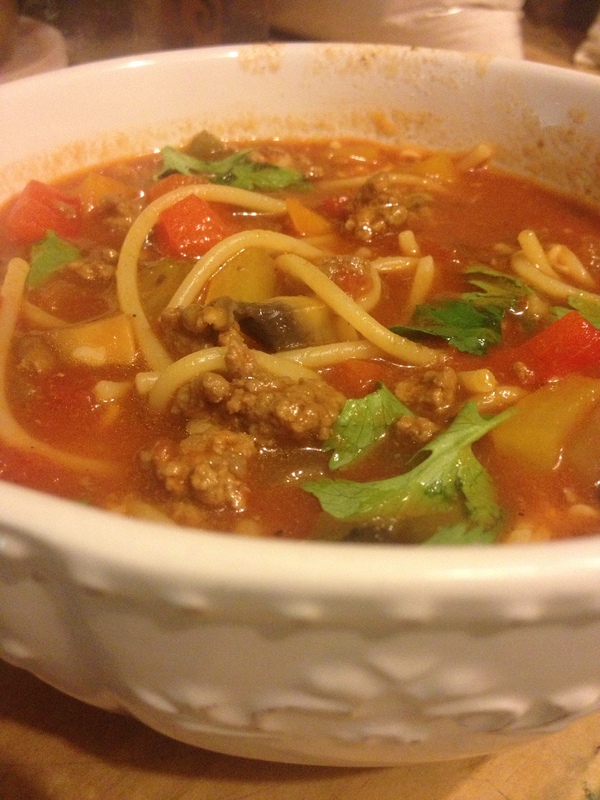 I also tend to add extra mushrooms or broth to make this meal stretch to feed my 8+ usual dinner crew! Brown 1 lb. 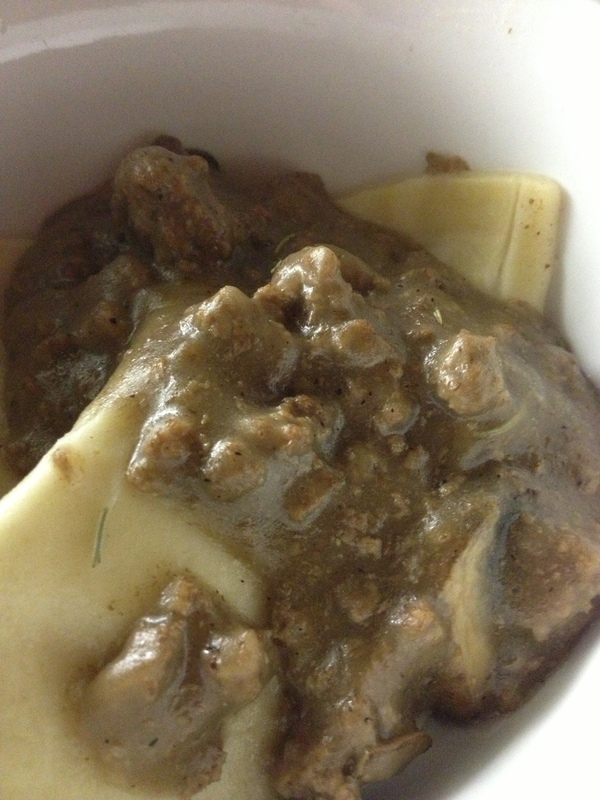 ground venison in a stock pot with 1/2 cup chopped creimini mushrooms in 2 Tbsp butter on medium. Season with salt and pepper to taste. Add one pinch crumbled dried rosemary and lower temperature slightly so as not to scorch the bottom (maybe this is just my old stove…?). Add 1/4 cup beef broth and simmer til liquid is mostly absorbed, then add another 1/4 cup beef broth and 1-2 tsp of cornstarch to thicken. (I continue alternating beef broth and cornstarch in the above increments until the gravy is as thick as I’d like). Re-season to taste and serve warm. 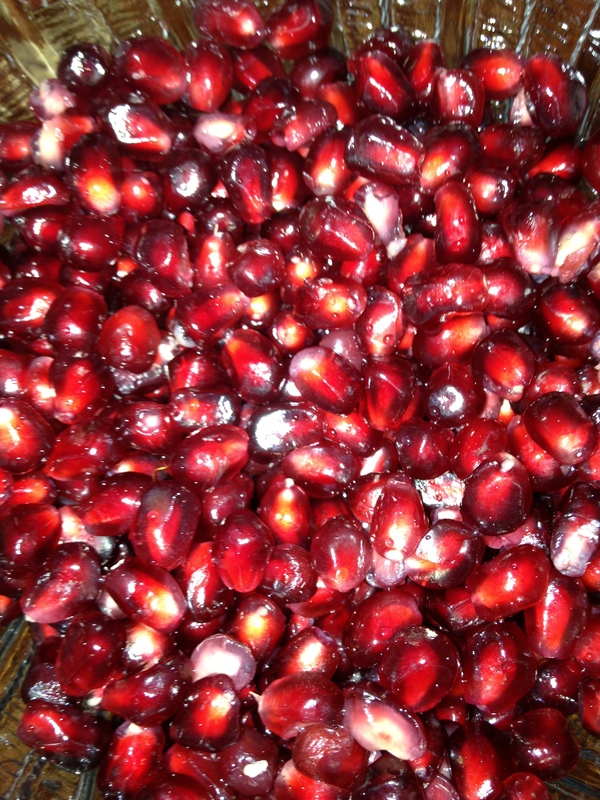 Do you have a favorite way to use this vibrant fruit? 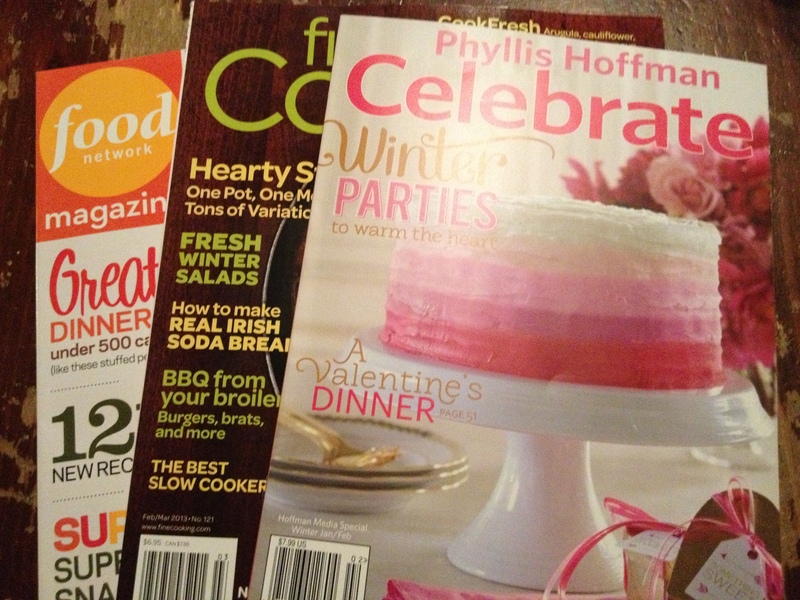 So tonight I picked up a few cooking magazines for inspiration…These are just a few of my “favs”. Believe me, I have a long list of publications I regularly check. These are just the lucky few that made it home. I can’t wait to try out some of the recipes. Stay posted!!! So — What magazines inspire you in the kitchen?? Not a native of the area, I have really come to enjoy living in Lancaster County, Pennsylvania. There is no shortage of farmers’ markets in the area. The one closest to me — Root’s (pronounced “ruts” by those in the know) — is open every Tuesday all year long. I am so thankful for the ability to obtain fresh fruits and veggies year-round, although of course we do better during harvest time than during the winter. It was cold here on Tuesday, with a biting wind, so most of my go-to vendors were not out and about. I did score some great veggies though — Such as organic spinach for only $1.50/bag…and it was not a skimpy bag. (I envision a nice spinach salad for lunch tomorrow…) Or the lemons I picked up 10 for $1. They are certainly not that cheap in the regular grocery store! I would’ve brought home more if we’d had more hands, lol!!! However, it was only my 8 year old son and myself, and our hands were already quite full! And I actually remembered to bring along my shopping bag, too — trouble is, we filled it way fast. But thankfully with healthy, fresh foods! So. I was recently browsing other food blogs — which is probably how I spend any spare time I have, if I’m not already reading a cookbook or looking at a cooking magazine — and I stumbled upon a recipe for Pear Vanilla Jam. I had to email it to myself while my laptop was down so it didn’t get lost in my “recipes” folder. Now it’s all printed out and safe in my canning recipe binder. You can find the original recipe at www.foodinjars.com/2011/02/pear-vanilla-jam/ Let me just say that I LOVE that blog. Quick note too: my stove top does not allow for the traditional size water bath canner if I’m going to have room to fit all the other stuff — like the actual pot with the recipe, the jar lids simmering, etc. Thus I am a HUGE fan of small batch preserving, which to me is any batch that makes about 8 jars (any size) or less, because then I’m not slaving over the stove the whole day. Unless, of course, I want to! This batch made 7 4-oz jars (or half-pints), plus a tad extra, which I gratefully sampled! I decided I had to try the recipe, so I added pears to my ever-growing shopping list. I use my iPhone “Reminders” app and have different lists for different things. I happen to have a grocery list for each market or store I frequent. At any rate, I proceeded to make the jam, with one little deviation from the original recipe. 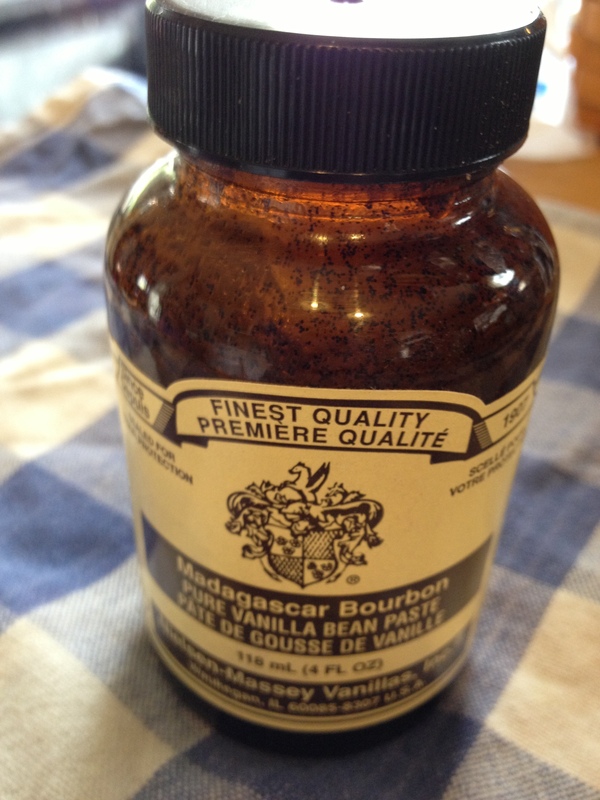 I couldn’t find my vanilla beans, and I certainly did not want to go buy any, so I dug out my Neilsen-Massey Madagascar Bourbon Vanilla Bean Paste, which I had purchased from Williams Sonoma for $11. That wa some time last year. I think it’s $12.95 online now. I will be buying some again very soon, as I use it a lot in place of whole beans or just vanilla extract. The rich flecks of bean in the paste appeal to me even more than using the traditional bean itself. You simply substitute one Tablespoon of paste for one whole bean. So I didn’t need to remove the beans before mashing the pears as stated in the recipe, and it all merged together quite beautifully for me. 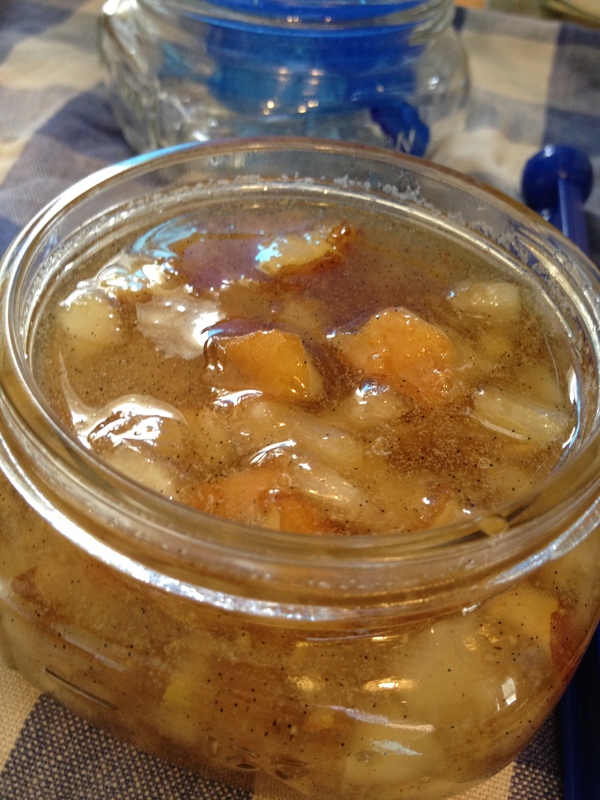 I also have to note that while this was all cooking up — before I put it into jars — the kitchen smelled heavenly…a heady combination of floral pear with the soft scent of vanilla. I am looking forward to baking a loaf of fresh bread later and spreading some of this love on there for breakfast this weekend!!! Here’s a pic of the jam that was just going into the fridge for immediate consumption, instead of the canner to savor later. You can see that I didn’t mash all the pears 100%, as I like my jams to have visible pieces of fruit. 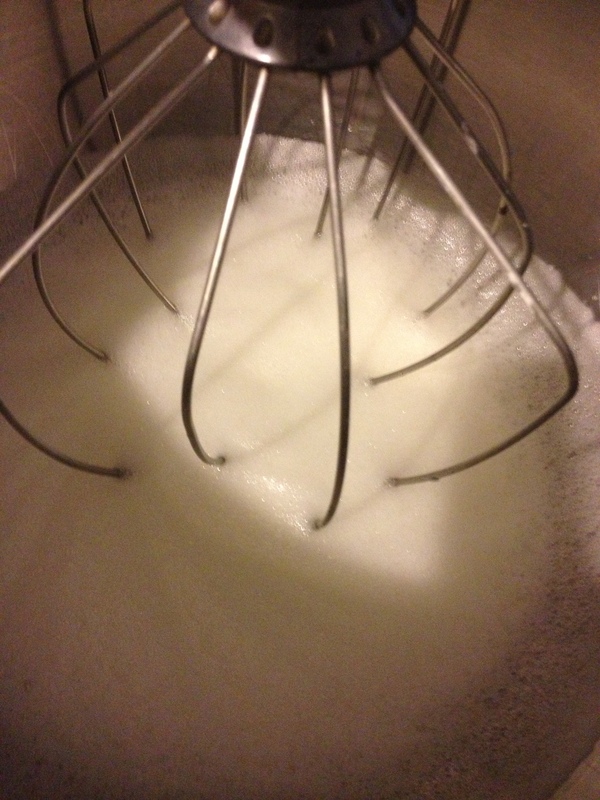 Plus I don’t have an immersion blender either, so I used the old reliable hand-held potato masher. Don’t be intimidated — canning is easy peasy!!! I want to note that I was not raised in a household where we canned. I originally learned how to can red beets — the first thing I ever canned — from a friend. Everything else I learned from taking classes at my local cooperative extension (an AMAZING source!). Once I got the hang of doing jams and jellies, I graduated myself to trying marmalades, tomato sauces, salsas and pickled products, and then started to foray into more complex recipes. Next step: to learn pressure canning. If I can figure out how to preserve foods and produce amazing results, anyone can. Seriously. Just be sure to follow directions to avoid potential issues with food poisoning. And never ever EVER chance using a product if the jar is suspect — ie, it wasn’t sealed or the food looks or smells bad. Start off with a Ball Blue Book or one put out/approved by the USDA and never substitute ingredients if you’re uncertain whether or not they’ll work. It’s usually okay to substitute small amounts of spices or flavorings for those called for in a recipe. Where you will get into trouble is if you add starchy foods or low acid foods to a high acid canning recipe, as they are canned by different processes to make sure the food is thoroughly cooked at a high enough temperature to avoid bacteria growth. If in doubt, contact your county extension agency and ask. But really, canning is sooooo simple! There are tons of delish recipes out there! And the great thing is that you know what’s in your food! No artificial this or that. So get up and play in the kitchen!!! Hi friends! I’m so excited to be kicking off the year 2013 with a new blog to address one of my passions in life — food — while utilizing one of my other passions, writing! So here’s a quick bit about me — I am a certifiable gourmand, or foodie. At least I would say so. There are not many foods — except meats — that I won’t try. That’s not to say I don’t cook meat. I do, for the family – just not as often as I used to, both for financial and health reasons. Speaking of family…I am a wife and stay-at-home mom of six (yes, six!!!!) children. And that doesn’t include all the “extras” who find their way to my house whenever I am making supper or baking! I love to do redwork stitching, card making and a few other things in my “spare time” (haha! what’s that??!). 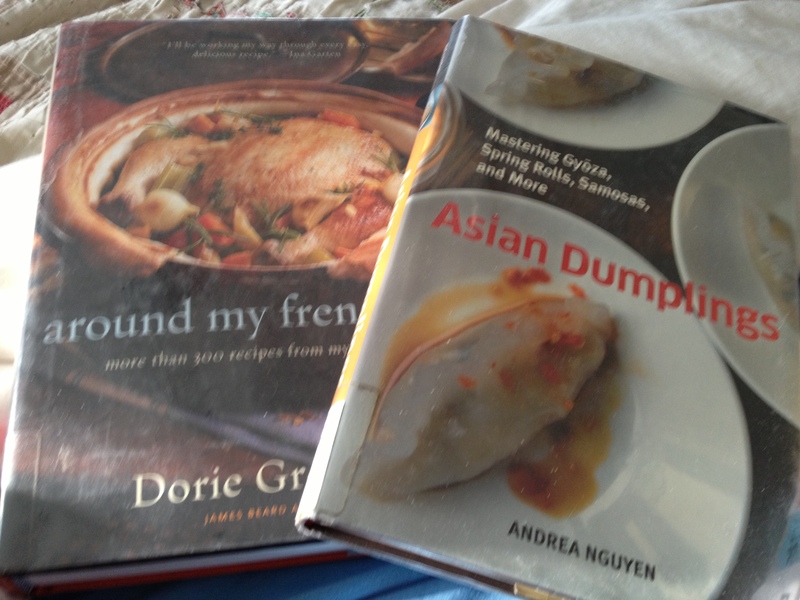 My other passion is reading, and I mainly love to read cookbooks. I am especially drawn to cookbooks or magazine articles where the food has some kind of story behind it. It just makes it more interesting and intriguing to me. So yeah, a lot of foodie things going on in my mind most of the time. I love to take a recipe and experiment if I can, or try to plate it in a way that gives it a new look. And I like to try to recreate dishes or things I enjoyed, such as chocolate covered candied orange slices (still perfecting the coating of chocolate). I also like to collect recipes from friends or other foodie blogs to try too. I made the best pitas ever that I found on a blog from my friend in Israel. Truthfully, sometimes it isn’t possible to keep up with my list of things to try in this crazy house, but I do dream of one day owning a bed and breakfast, or a quaint cafe…something like that where I can still play with my food! So here is the tried-and-true recipe for Aunt Mary Ruth’s Chocolate Chip Cookies (I really am too used to the name by now!). They are not flat and crisp like other chocolate chip cookie recipes I’ve tried. Rather, they have a cakey light quality which makes them one of my favs. I should also note: my father loves these cookies! I have to set aside 1-2 dozen for him every time I make them! The yield really depends on the size you make them. I usually end up with around 5+ dozen, but that’s just me. Also, please excuse the lack of photos…I can’t keep these cookies around long enough to take any! * Preheat oven to 375*F.
* Mix 1 tsp baking soda with 1 tsp baking powder, 1 tsp salt and 4 cups of flour. Set side. * Cream together 2 cups light brown sugar with 1 cup butter-flavored Crisco (plain is fine too). Add 3 eggs, one at a time, beating well to incorporate. * Add in 1/2 cup milk and 1 tsp vanilla extract. * Add the dry ingredients slowly and mix well. * Stir in 2 12-oz. bags chocolate chips and 1 cup chopped walnuts (optional). * Drop by teaspoonful onto cookie sheet and bake for 10 minutes or til lightly browned.